Memphis hosted a rival from days gone by in a rare Wednesday-night tilt at the Liberty Bowl. Facing Cincinnati for the first time since 2004 (when the Bearcats played their last season in Conference USA), the Tigers made a pair of costly turnovers that led to touchdowns for the visitors. And facing the 7th-ranked defense in the country, Memphis managed only 232 yards in a loss that drops the Tigers to 1-6 on the season (and 0-4 in American Athletic Conference play). With 23,571 fans forsaking the telecast of the Grizzlies' season opener in San Antonio, the Tigers traded punches with Cincinnati through the first half. They converted a fourth-down attempt deep in Bearcat territory before quarterback Paxton Lynch connected with Tevin Jones for a seven-yard touchdown to give the U of M a 7-0 lead with less than two minutes to play in the opening quarter. Cincinnati answered with a 13-yard TD dash by backup quarterback Jordan Luallen early in the second quarter, then capitalized on Tiger tailback Marquis Warford's sixth fumble of the season. Having recovered the ball at the Memphis 19, the Bearcats needed but one play — a scamper by Ralph Abernathy — to take the lead for good (14-7) 3:25 before halftime. Tion Green ran the final two yards of an 11-play, 68-yard Bearcat drive to give the visitors a 21-7 lead just over five minutes into the third quarter. But the Tigers put together their strongest drive of the game to answer: 12 plays, 70 yards in 5:19, the final seven coming on a pass from Lynch to Brandon Hayes. Down 21-14, the Tiger defense was backed up near its own end zone early in the fourth quarter, only to be rescued by a Bobby McCain interception of a Brendon Kay pass. (McCain returned to action after missing twp games with a knee injury.) Memphis failed to capitalize, though, Lynch throwing an interception himself — falling into the Tiger end zone as he threw the pass — with 8:42 left to play. Kay connected with Anthony McClung for 24 yards just over a minute later to give the Bearcats a 27-14 cushion (the PAT was missed). On the Tigers' next drive, Hayes electrified the few remaining fans with a 31-yard touchdown run, one that featured a pair of cuts and a dive to the end-zone pylon over the last five yards. The score gives Hayes a team-leading five touchdowns on the season. But Cincinnati marched steadily downfield with its final possession of the game, Tion Green scoring on a three-yard run for the game's final score. Lynch finished the game completing 17 of 33 passes for 140 yards, while Hayes gained 76 yards on 17 carries to lead the Tigers. Kay hit 27 of 35 passes for 321 yards, while McClung pulled down nine passes for 98 yards to help Cincinnati improve to 6-2 on the season. The Tigers will next host FCS foe UT-Martin on November 9th, with kickoff scheduled for 3:30 at the Liberty Bowl. Then three of the Tigers' final four games will be played on the road. • There were more than 40,000 empty seats at the Liberty Bowl last Saturday. With 16,241 tickets sold for the Tigers’ game against SMU, the football team drew 2,000 fewer fans than did the basketball team — for a glorified practice — the night before. (Granted, those basketball fans entered FedExForum for Memphis Madness with free tickets.) Just when you’d like to think second-year coach Justin Fuente has started a real movement, one that will hook a community supposedly desperate for good local football, along come the Mustangs for an 11 a.m. kickoff. And with the dawn of college basketball season to provide an ugly contrast. The Liberty Bowl is too big for the Tiger program (broken-record alert). Saturday was gray and gloomy — before kickoff — and the game started before most Memphians had digested breakfast. But this was the city’s flagship college program hosting a conference foe in mid-October. If such a contest can’t fill the Liberty Bowl to half its capacity, the statement for the future of Tiger football isn’t loud and proud, but meek and weak. Recruits do their homework. That pocket-collapsing pass-rusher from the Sunshine State? He can do the math on 16,000 fans in a 60,000-seat stadium. And Memphis just got crossed off his list of possible visits. I’ll say this: Those fans sitting in the Liberty Bowl at halftime last Saturday are my favorite sports fans in Memphis. (There weren’t 16,000 left in the second half.) Their team down by four touchdowns (with a blustery wind making a cool day colder), those football fans in blue define “diehard” for me. They deserve better than the Tigers showed in the first half Saturday. When Fuente apologized before opening his postgame remarks, he was apologizing to them. There aren’t all that many, but those fans are the faces of the Memphis football program. • With the Tigers down 31-3 at halftime, chatter in the press box centered on senior backup quarterback Jacob Karam. Might Fuente put Karam in the game to provide a spark to open the second half? It’s the nature of football: the backup-QB “spark.” Had Fuente replaced his entire offensive line for a series, a message would certainly have been delivered . . . but a spark created? Paxton Lynch is Fuente’s guy. Resist this as the losses mount and you’re only complicating the frustration of cheering a team with multiple gaps yet to fill. Fuente gave the job to Lynch the second week of training camp in August, all but telling any followers of his program that one quarterback is head and shoulders better than the others on the roster (in Lynch’s case, literally). And when the keys are handed to a superior signal-caller, that includes driving along bumpy stretches of the road. The first time Lynch is removed in the name of a proverbial “spark,” he’ll be checking the sideline every time a play or drive goes sour. And that kind of anxiety compromises a quarterback’s ability to lead. Jacob Karam is a prince of a human being, and a good backup quarterback. Period. • At the season’s midway point, the Tigers find themselves with the same record (1-5) they held halfway through the 2012 season. Any signs of progress? Not much in terms of scoring, as the team is averaging 20.2 points per game compared with 18.3 after six games last year. (And remember 14 points last Saturday were courtesy of linebacker Ryan Coleman.) But the Memphis defense is allowing considerably fewer points (22.5 per game, compared with 31.7 in ’12) and yards (331.0, compared with 423.3). And while the offense isn’t reaching the end zone more frequently, it is moving the football, averaging 359.7 yards per game, compared with 288.2 after six games last season. You could have tracked the home team's performance today with weather updates. Kicking off at the Liberty Bowl (at 11 a.m.) under gray skies, the University of Memphis looked like one-win teams are expected to look in mid-October: a lifeless offense, porous defense, and large deficit (31-3 at halftime) on the scoreboard. Then late in the third quarter, just as the sun finally burned the clouds away — creating a rather blinding sparkle off the Tigers' new chrome helmets — Memphis invigorated a small crowd (16,241) with opportunistic defense and special teams, falling a play or two shy of a season-changing comeback victory. Today's silver lining? The Tigers won the second half, 26-3. Tiger coach Justin Fuente acknowledged his team being outplayed on both sides of the ball — and severely — over the game's first 30 minutes. "It's a combination of several things," he said. "A developing offensive line, young receivers and skill players. They'll make some plays, then they'll make you pull your hair out. We're not good enough at anything to dominate in one area or another." On the game's second play from scrimmage, SMU quarterback Garrett Gilbert found Keenan Holman for a 79-yard catch-and-run touchdown that put the Mustangs up, it turns out, for good. Down 7-3 late in the first quarter, the Tigers were unable to capitalize on a blocked punt, freshman kicker Jake Elliott pushing a 39-yard field goal attempt wide right for the first miss of his college career. Mustang tailback Traylon Shed scored a pair of one-yard touchdowns in the second quarter, one of them after SMU recovered a muffed exchange between Tiger quarterback Paxton Lynch and Marquis Warford. (The Tigers have fumbled the ball eight times over their last two games, losing five of them.) At the break, SMU had outgained Memphis, 282 yards to 116. The Tiger offense was finally able to reach pay dirt when Brandon Hayes carried the ball in from the one-yard line with 5:23 left in the game, making the score 34-23, SMU. Despite a Lynch interception on their next possession, the Tigers were again able to close the gap — alas, as time expired — on an eight-yard pass completion from Lynch to Mose Frazier. After gaining 150 yards over the game's first three quarters, Memphis piled up 170 in the fourth period. Lynch completed 26 of 36 passes for 198 yards, while Gilbert was 27 of 43 for 321. The loss drops Memphis to 1-5 for the season (0-3 in the American Athletic Conference), while SMU improves to 2-4 (1-1). "I was disappointed with our perimeter game on both sides," said Fuente, "and I felt like, going in, it was an advantage. Defensively, we've been outstanding in our perimeter game. Since halfway through last season, I felt like we dominated the perimeter game. Little wide-receiver screens, we tackled. And on offense, when we did it, we were pretty good at it. I did not feel that way today. The [series] that sticks out in my mind is the one after the blocked punt. Poor execution." The Tigers were hurt by nine penalties, including a hands-to-face infraction late in the fourth quarter that negated a 68-yard scoring pass from Lynch to Joe Craig. The offense converted only four of 14 third-down opportunities. Memphis now begins a stretch in which they'll play one game in three weeks, a Wednesday-night tilt at the Liberty Bowl against Cincinnati on October 30th. The Tigers will need to go 5-1 over the season's second half to gain bowl eligibility. • Beyond wins and losses, it’s hard to quantify the rebuilding progress of a college football program. However you view the second year of Justin Fuente’s master project, more people are viewing it with you. Tickets sold for the Tigers’ first three home games of 2012 looked like this: 39,076 . . . 27,113 . . . 17,831 (total of 84,020). And this year’s numbers: 44,237 . . . 36,279 . . . 30,274 (total of 110,790). 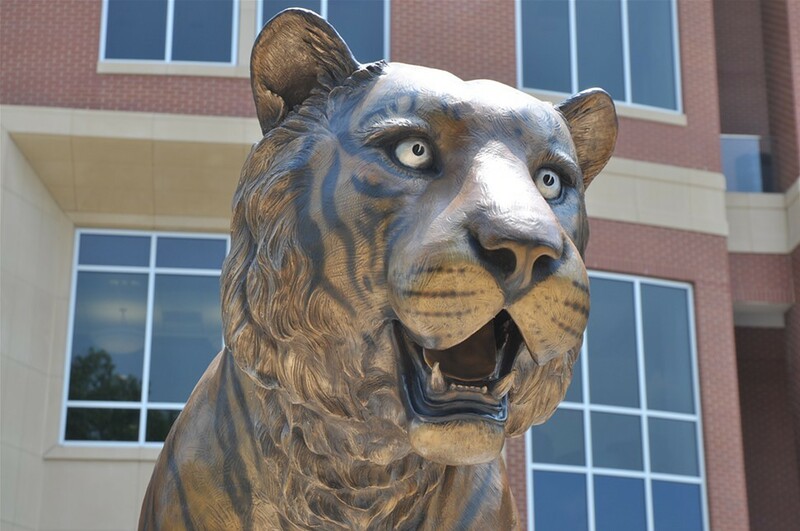 Using the clearest gauge we have for community interest, Tiger football is up 31 percent from this point a year ago. • Before every season, we examine a schedule and mark what we consider “winnable” games. Then, of course, the season starts and what we saw on paper is chewed up and regurgitated by actual football teams, actual players. A month into the season, four American opponents the Tigers have yet to play have combined for a record of 2-17. Memphis will host SMU (1-4) and Temple (0-5); they’ll travel to USF (1-4) and UConn (0-4). Throw in UT-Martin, and today’s paper tells us a strong second half of the season could yield as many as six Tiger wins . . . and bowl eligibility. The midweek game against Cincinnati (at the Liberty Bowl on Wednesday, October 30th) could prove to be a season tipping point. Much to follow in the coming weeks. • Memphis and Houston should be bitter rivals. Tigers vs. Cougars (cat fight!). Grizzlies vs. Rockets (NBA fight!). FedEx vs. NASA (flight fight!). Need more? In 1997, the NFL’s Oilers left the Astrodome for the Liberty Bowl (insert snicker). Yet despite 17 years in Conference USA together — and now a partnership in the American — Memphis and Houston don’t seem to rile one another all that much. The Cougars lead the series 12-9 (7-5 since the schools joined C-USA in 1996) and have won the last three meetings, putting up more than 50 points in 2009 (at Houston ) and 2010 (at Memphis). This is a game every Memphis fan should have circled in red(!) on their schedules. Saturday could get ugly. Coach Tony Levine’s staff has had two weeks to prepare for the Tigers. One of the last two undefeated teams in the American (along with Louisville), the Cougars have averaged 43.5 points per game and lead the league in total offense (534.0 yards per game). After their last game, quarterback John O’Korn and cornerback William Jackson were honored with the American’s offensive and defensive player of the week, respectively. The game will surely tilt on Houston’s running attack. If the Cougars approach their average of 226.5 yards per game, the Tigers will come home for SMU with a 1-4 record. If the Memphis defense can keep things closer to the 81.3 yards its last three opponents have averaged on the ground, we might see another game decided in the fourth quarter. Playing their first American Athletic Conference game, the Tigers came painfully close to their biggest win in several years. Had Memphis passes into the end zone — one by quarterback Paxton Lynch, another by tailback Brandon Hayes — landed in Tiger hands instead of those of their opponents from UCF, the U of M likely celebrates a second straight victory and a 2-2 record. But with those two interceptions, along with a bizarre sequence of close calls over the game's final four minutes, Memphis falls to 1-3 on the season and has now lost nine straight to the Knights. "I couldn't be more proud of our kids," said Memphis coach Justin Fuente. "That's a group of men that went into battle for each other. We didn't make enough plays to win the game. It's nobody else's fault. It's on us." In all three Memphis losses this season, the Tigers have led or been tied in the fourth quarter. After forcing UCF to punt after three plays on the game's opening possession, the Tigers drove 67 yards on just seven plays to take a 7-0 lead on a 16-yard scamper by Hayes. (It was the second straight game Memphis has scored on its opening possession.) The drive was highlighted by 26-yard pass from Lynch to tight end Alan Cross. The Knights capitalized on an interception by Jacoby Glenn late in the first quarter to earn their first points: a 26-yard field goal by Shawn Moffitt. Glenn returned the pick 33 yards and was finally tackled at the Tiger 26-yard line by the man who threw the pass (Lynch). Memphis drove into the UCF red zone late in the first half, keyed by a 44-yard pass-and-run to Mose Frazier, a 14-yard run by tailback Jai Steib, and a 19-yard connection from Lynch to Joe Craig. A second-down pass from the 8-yard line was dropped in the front corner of the end zone by Adrian Henderson, then Lynch had a deflected pass intercepted by UCF's Terrance Plummer on the next play. Despite holding a dangerous UCF offense to 95 yards over the game's first 30 minutes, the Tigers led only 7-3 at halftime. William Stanback finished a 12-play UCF drive with a one-yard run to give the visitors the lead with 5:48 left to play in the third quarter. But the Tigers answered with a 48-yard field goal by freshman kicker Jake Elliot to tie the game three minutes later. With the ball at the UCF 48 early in the fourth quarter, the Tigers lined up in punt formation, only to have punter Tom Hornsey tuck the ball and dart through the right side of the line for a 14-yard gain. With the crowd of 30,274 fully energized, Lynch found Tevin Jones for 21 yards, then handed the ball to freshman Sam Craft, who ran around left end and through three UCF defenders for a touchdown that gave Memphis a 17-10 lead. That lead appeared to be enough, right up to the 3:11 mark, when UCF faced fourth-and-ten from the Memphis 28-yard line. But Knight quarterback Blake Bortles completed a 15-yard pass to Breshad Perriman to keep the UCF hopes alive. Two plays later, Storm Johnson carried the ball from the one, fumbled, and watched tackle Chris Martin recover the ball in the end zone to tie the game at 17. On the ensuing kickoff, Tiger freshman Marquis Warford was crushed at the 12-yard line, fumbled the ball, and lay prone as UCF's Drico Johnson picked up the ball and ran into the end zone untouched. Fuente asked for a booth review, but the play was upheld, despite some talk about a helmet-to-helmet hit that could have been penalized. The score gave UCF a 24-17 lead with 1:56 to play. Junior wideout Joe Craig replaced Warford on the next kickoff and proceeded to dash 97 yards for what could have been a game-tying touchdown. 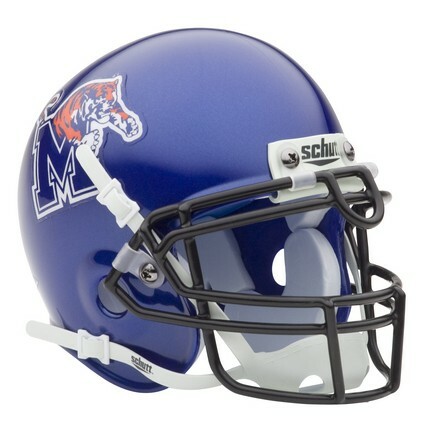 The play was nullified, though, by an illegal Tiger block that brought the ball back to the Memphis 25-yard line. Lynch led the first two-minute drill of his college career in style, completing passes to Craft, Frazier, and Jones on a march that took the Tigers to the UCF 6-yard line with less than 45 seconds to play. But on a halfback option play, Hayes lofted a pass toward the right corner of the end zone, where it was intercepted by Plummer, your leading candidate for American Defensive Player of the Week (he also had a sack of Lynch, one of five times the Tiger quarterback was dropped). "We can't let this linger," said Fuente. "It's life, and life isn't always easy." When asked about how he would handle such a crushing loss, Fuente responded, "When I got here, there weren't crushing losses. They were just crushed." The coach was pleased that his defense held a potent offense to 17 points, despite losing junior cornerback Bobby McCain to a left-knee injury in the first half. "Our kids understand the scheme," he said, "and they're flying to the football. When you're half a step off, it glares at you against a team like [UCF]." Lynch completed 20 of 38 passes for 279 yards. (Bortles was 17 of 36 for 160.) Linebacker Tank Jakes picked up the only sack of the game for Memphis, which came into the game leading the American with 13 for the season. Hayes led the ground game with 73 yards on 12 carries. Lynch saluted the conquering team, all the while turning his eye to next week's challenge at Houston. "This was one of the most diverse defenses we'll face," he said. "We know we can win now. We just have to go out and do it, and not hurt ourselves. When I make a mistake, it's rough. But after you mess up, you have to shake it off." O’Leary took over the program in 2004, only its ninth in Division I. And UCF stunk up the place (0-11) for exactly one season. In 2005 — playing in Conference USA for the first time, which helps — UCF went 8-5 and played in its first bowl game (a loss to Nevada in the Hawaii Bowl). The Knights have since had three 10-win seasons, played in the C-USA championship game four times (winning twice), and played in four more bowl games (they’re 1-1 in the AutoZone Liberty Bowl). This year they’ve already beaten Penn State and made South Carolina sweat considerably. With Louisville leaving the American next season, UCF will be the face of this new football conference. The Tigers’ annual meeting with this team is a new and valuable litmus test for a program seeking relevance. • Among several promising sights in the Tigers’ win over Arkansas State two weeks ago, one stood out: the pass rush. Led by junior end Martin Ifedi (2.5 sacks, 4.5 tackles for loss), the Tigers tied a program record with seven sacks, all but grounding the Red Wolves’ passing game. Despite playing only three games, Memphis leads the American Athletic Conference with 13 sacks for the season (the rest of the league has played four games each). Compare this total with 29 in 12 games last season, and you have the kind of trend that could impact a won-lost record. Andre Arnold holds the program’s single-season record for sacks with 13 (in 2000). Ifedi (5.5 through three games) could reach that mark by Halloween. • Entering the season, Fuente emphasized that this year’s team has the kind of depth that will allow the coaching staff to make choices when it comes to attacking an opponent. There are multiple weapons along the defensive line (five players were in on the seven sacks against ASU) and, after what we saw two weeks ago, there may be a threatening tandem of Tiger tailbacks. Senior Brandon Hayes is the top returning rusher (576 yards in 2012), so his 114 yards — and 6.3 average on 18 carries — was pleasant, but can’t be called a surprise. But freshman Marquis Warford? Who had the diminutive Texan (he stands 5’8”) averaging 15.7 yards on 11 carries in his third college game? No way do these kind of numbers repeat themselves Saturday against UCF. But if the Tigers’ current version of Thunder & Lightning (my buddy Greg Gaston prefers to keep it local and call them “Hustle & Flow”) can find holes through a still-evolving Tiger offensive line, Memphis can control the clock to a degree, and limit the chances Knight quarterback Blake Bortles has to light up the scoreboard.